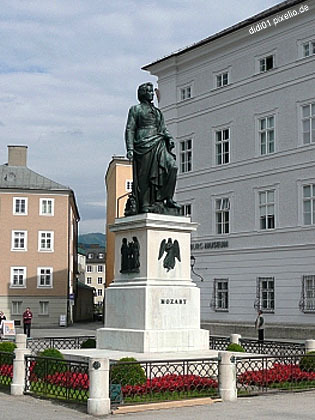 Mozart was born some 250 years ago in Salzburg, back then an independent principality within the Holy Roman Empire. He fled Salzburg deeply upset about the ruling Prince Archbishop and spent much of his creative life on journeys or in Vienna. In the course of the Napoleonic Wars, Salzburg was plundered by Bavarian troops and later became part of Austria. Once its economy started to recover (much through the help from Vienna and the rising tourism), Salzburg discovered its love for Mozart. Today, the millions of tourists that invade Salzburg every year find the master on T-shirts, sweets, liquors, and any tacky souvenir one could possibly think of. It is hard to believe that there is a "real" Salzburg behind all this kitsch - but there is. It just takes a bit longer to find it. In Vienna, you can visit a museum dedicated to Mozart in a former flat of his.